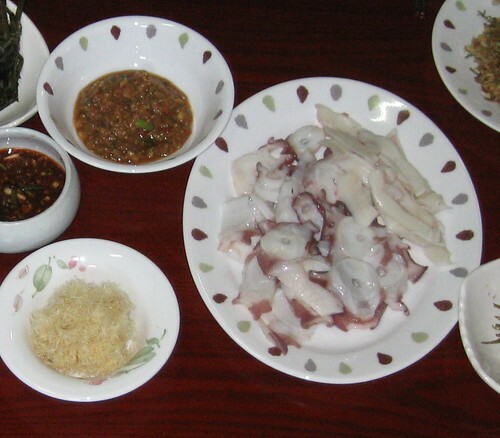 The best Korean food EVER – Hello Korea ! 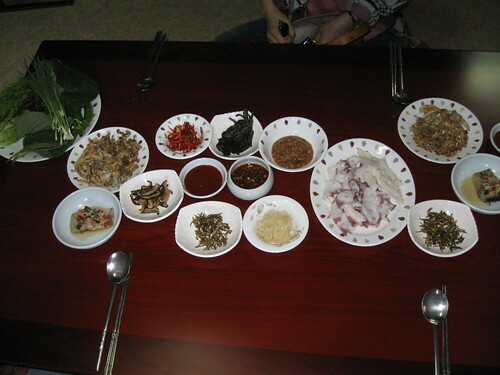 This is the table Nine Stone’s mother-in-law set for us in Andong, who is renowned for her cooking. I told my tutor about this meal, and she was jealous. “Even I haven’t ever had a traditional meal like that.” Everything on the table was made from scratch by her. At the upper left is the best (and only) tempura I have ever eaten and liked. It was sooo delicate and melted on your mouth. I asked what was in it, and the answer was: flowers and peppers. Later, I asked how it was made, because the batter seemed lighter and finer textured, and I suspected that the flour was milled finer than normal. After I found out that the delicacy was flowers, I wondered how they did not get totally destroyed during the process. The flowers are lightly tossed in the flour and then gently steamed, and then fried. Not greasy at all. Can’t tell you what a delight it was to experience the lightly sweet flowers and the also sweet yet spicy peppers. I’m not sure if the next dish is ginseng, but it had that kind of flavor and texture but covered in a sweetened red pepper sauce. I also don’t know which green that was in the next dish, but it was yummy. The reconstituted dried sardines at the lower right seem like typical fare, yet these were seasoned just right and not overly salty. 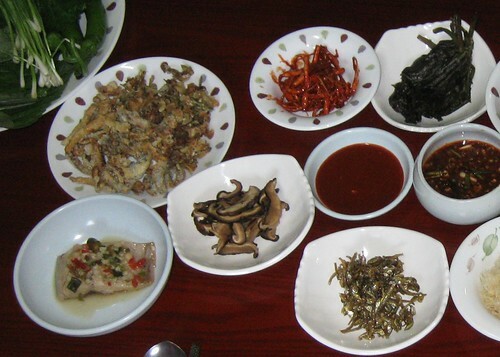 Of course that is mushrooms next and at the lower left was the most scrumptious salt fish ever, covered very simply by green onions and red peppers. some kind of bean paste sauce (again, better than what you’d buy in the store) sushi (Korean’s call sashimi sushi) which is octopus, and rolled shredded dried fish. These are handmade noodles. Rolled flat and hand cut, they were super thin and delicate, covered with nothing more than the dried seaweed, thinly sliced fried egg (I can’t remember what the vegetables are) and sesame seeds. No sauce, just the flavors of the foods shining through. It was incredibly subtle and light. 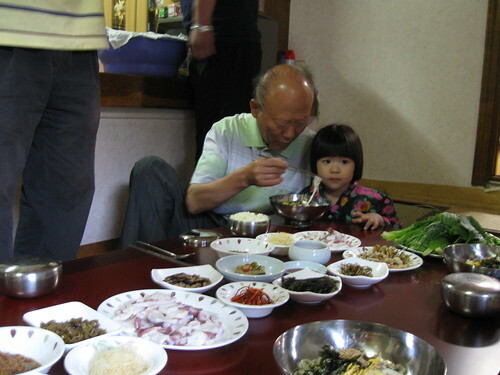 Halabeoji feeds his grand daughter yummy noodles…lucky girl! Halmoni and her daughter didn’t eat until everyone else was finished, eating whatever side dishes were left. I wanted to help them clean up, but was told because I was a teacher and guest that would be inappropriate. She kept apologizing for the flavor of the food and hoped it wasn’t too strong, since she had a cold and couldn’t taste as well. Nine Stone’s wife joined us the following day and I asked her if she could cook like her mother. She said her mother refused to teach her, because she didn’t want her to ever have to work that hard and that she had to concentrate on studies and go to college. Such is the case with most young women these days, like my students, who only know how to fry an egg, can’t make kimchi, and eat instant noodles on the run. How I wish I had some money to pay for an internship and that she had the will to teach me! 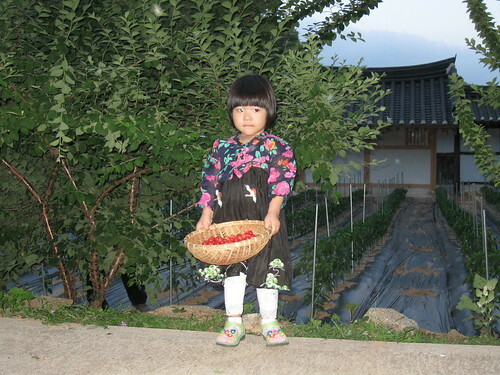 To learn about the local wild edible greens, how to pick them, dry them and prepare them, how to cook over a wood-fired stove and orchestrate everything to maximize energy efficiency, wash the clothes, keep the fire going, clean, sew the clothes (she sews her own hanboks) and feed the family, etc. A treasure trove of knowledge and yes, back- breaking work of an era that will soon be gone forever. the hanbok dress was made by the grandmother by hand, of course. Like your tutor – I am jealous too! Those noodles look absolutely delicious! Your grand daughter is cute. I love cherries. Enjouyed your blog. It looks great. The blogging and being victimized by Holt YET AGAIN and looking for Kim Sook Ja are eating me up alive lately. I have been lucky enough to have home cooked Korean food now and again with a Korean immigrant family we visit with. For a time, she (mom, cook) would try harder each time to come up with something she thought I would not eat. Even her own family would avoid it. But I refused to give in and ate every single bite. Mostly it was great stuff. If I found myself living on that food I would be happy. However I cannot get my children to eat it.